A Year Through The Lens: Day 279 – Yangon skyline. 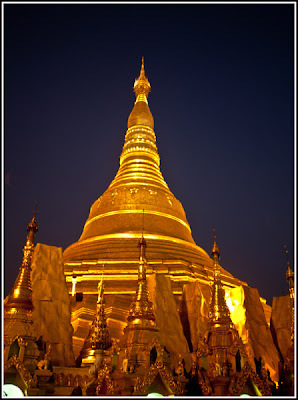 High on a hill in Yangon sits the Shwedagon Pagoda. Golden peaks reach for the heavens. 99 metres above the tip has diamonds that shine different colours of the rainbow depending on the angle you stand. Hidden under the bamboo covers stupa’s are under restorations, gold leaf being reapplied to keep the 2,000 year plus Pagoda in amazing glory.